AdWords has introduced call metrics, a new feature that lets advertisers measure the number of phone calls generated by their AdWords campaigns. This new AdWords Ad Extension is in BETA and will gradually become available to more advertisers over time. AdWords call metrics is a new feature that lets advertisers measure the number of phone calls generated by their AdWords campaigns. Using the technology behind Google Voice, call metrics creates a unique phone number for each AdWords campaign which is automatically inserted into an ad when it appears on Google.com, on both desktop computers & high-end mobile devices. When a potential customer calls the number in an ad, AdWords notes that the call took place. Then, when an advertiser views their AdWords reports, they’ll see the number of calls they received and other metrics, including call duration. Why should AdWords Advertisers Use Call Metrics? With insight into how many calls their ads are generating, they’ll get a better understanding of the value that AdWords is bringing to their business. At the same time, featuring a phone number in an ad will give potential customers another way to reach advertisers. 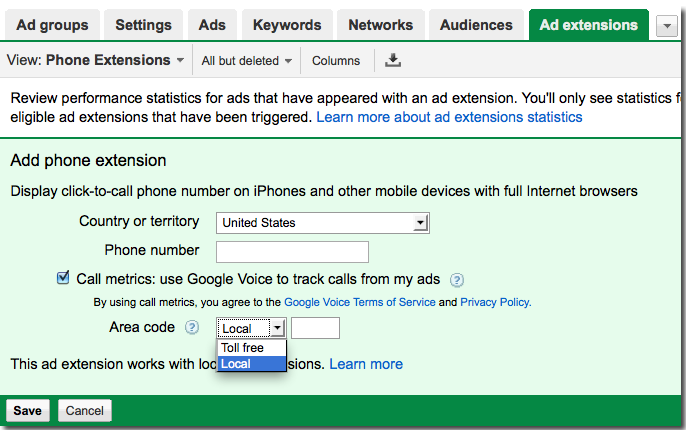 More about Google AdWords New Phone Ad Extension – Call Metrics. This entry was posted on November 2, 2010 at 5:22 pm and is filed under Advertiser, AdWords Ad Extensions, AdWords Call Metrics, Call Metrics, Google Adwords Campaign, Google AdWords Phone Extensions. You can follow any responses to this entry through the RSS 2.0 feed. You can leave a response, or trackback from your own site.